This tutorial will demonstrate my step-by-step glaze and stain technique customizing the solid e.max abutment/crown. My current favored stain and glaze system is Ivocolor. 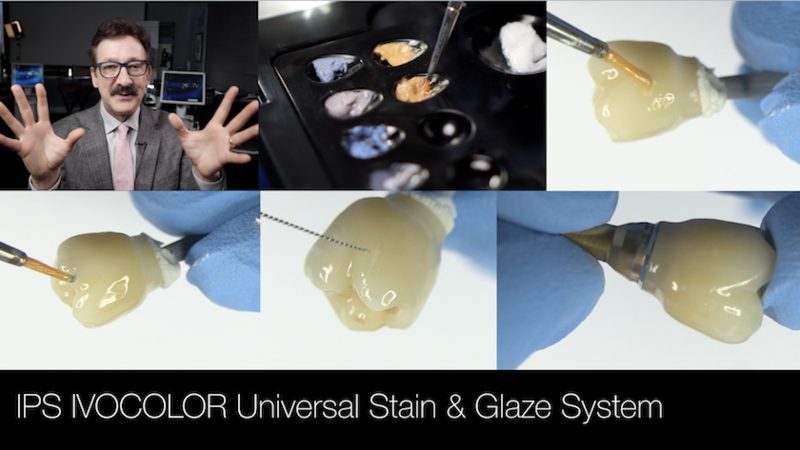 It is a universal stain and glaze system "one on all" and works well on micro felspathic, lucite, disilicate, and zirconia surfaces. Ivocolor is a very forgiving system, basically no bubbling. It is very predictable, what you see with stain color harmony in the application state will be what is seen in the post-firing condition.